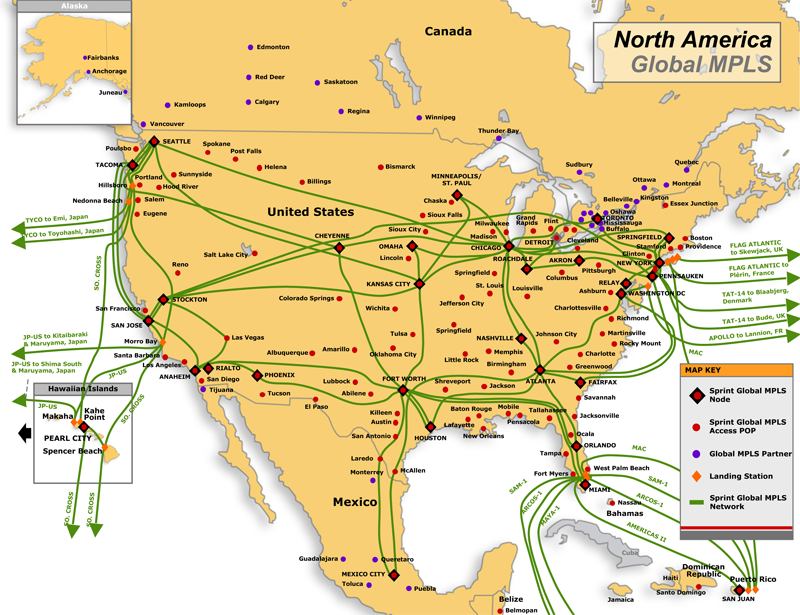 On this page is a collection of links to maps of US longhaul and intra-regional fiber networks. Maps are links to material on company websites wherever possible. Fiber may be owned or leased via long term IRU. To be on this list, a provider should provide intercity transport services between at least 5 states. I realize 5 is arbitrary, but at the moment it seems to be a reasonable number. Maps for pure metro and smaller regional providers will be collected on another page at some point. Because these are links to external sites, they may get broken from time to time when pages are moved, updated, or simply deleted. This list will be maintained but I can do a better job if readers help out. So if you see a broken link please leave a comment or email the webmaster so I can fix it promptly. If you know of a network that should be here but has mysteriously slipped past my nets, please leave a comment - this is meant to be an inclusive list, not an exclusive one. The BT map is just the Qwest map – it in fact says so on the page. Added Nuvox map, fixed Integra Telecom map, and moved Savvis to the global maps page. My company provides transport services across the USA and we are in over 30 states. The fiber is Level 3 leased fiber on an IRU and was built by the National LabmdaRail. Darkstrand then purchased 50% of the network capacity with the exclusive rights to commercialize it. I was wondering if our network would qualify to be posed on this page. This is great information, thanks a lot.Can you include C&W network info too? What about adding Hurricane Electric? I have added HE now to both the international and US maps pages, thanks for the suggestion! This page would serve better being in Wikipedia, I think. Perhaps we should just move everything to the biggest sites and fold up shop! 🙂 Ah well, wikipedia has various lists of backbones and cables already, I just haven’t found them to be as focused on one idea. The Lightower fiber map link is broken, we have recently revamped our site and this is perhaps the reason…in any event, we are up and running now if you wouldn’t mind fixing, thanks! Thanks Jennifer, I have updated the link. 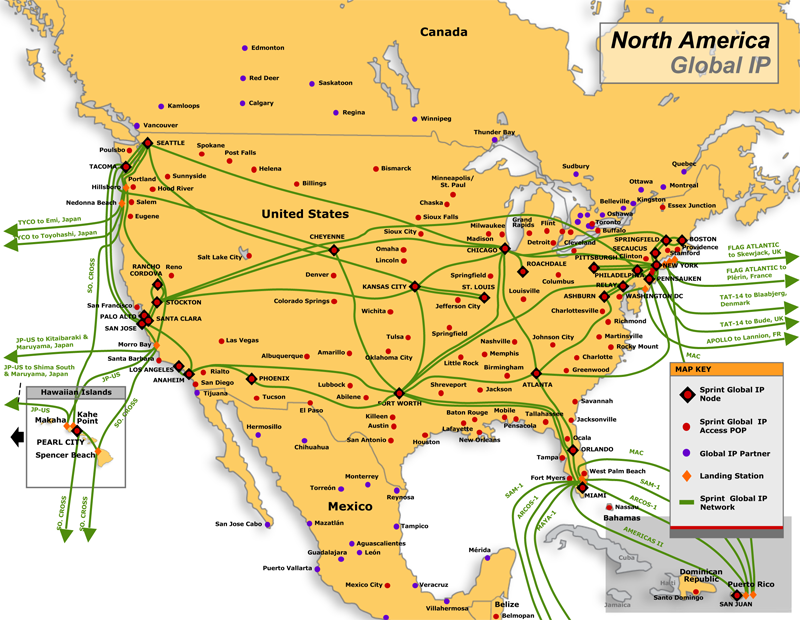 The map shown for BTGS is only for Internet Access; BT GS Network infrastructure is totally separate and apart from network used to provide internet access services. Do you know of anyone that has a map by street of available fiber? Take a look at the below post. Not sure what you are looking for, but on Zayo Enterprise Networks’ website you can zoom into your exact location and see where the closest network is. Somehow, I doubt it was built. Maybe purchased. Has anyone got network maps for the providers in the Grand Cayman?? Many thanks in advance! Great site! Wish I found it earlier. Thought you should know the Level 3 links are broken. Thanks for the heads up! I have fixed the LVLT link (they have revamped the whole wite and finally got rid of the old interactive map), but PAETEC’s works for me. Great Site! Important list and appreciate all the work to put it together! 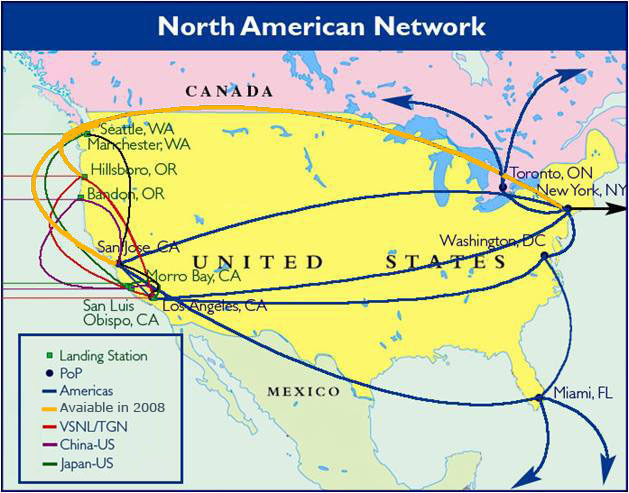 I am trying to validate a concept that 90%+/- of the digital impulse from the east coast and midwest flows to the Denver area then 90% +/- north past http://www.niobraraenergypark.com to Cheyenne then westward to the west coast ( and vis virsa). Is there a USA map graphic that may help validate this? Warren Buffett says he’s not much of a traveler. In fact, until just recently, he had never been south of the equator in his global travels. But Level 3 can give him a ticket to Latin America with the new Global Crossing blood on Level 3’s board of directors. Maybe one of Warren’s newly hired capital allocators, Todd or Ted may infuse some new blood of their own into the LVLT machine. Looking a head into the future of LVLT, while wearing my Google Goggles, I see a huge huge free cash cow. When I turn the kaleidoscope ever so slightly it shows a world wide web in the hands of the one and only WEB, connecting us all. This is a great resource page. Thanks for the upkeep. This is a fantastic resource page! Thank you for sharing! The site was recently re-designed and the map coverage has been moved. The following links for fiber maps on the page for Canada are broken. Thanks for maintaining this useful resource. PAETEC was acquired by Windstream. For that matter, the existing link for Windstream is an old/broken link anyway. want some help with that?